Foxglove flower card from punched circles. ...for a card in a hurry. This Foxglove Flower Card is another easy to make card. 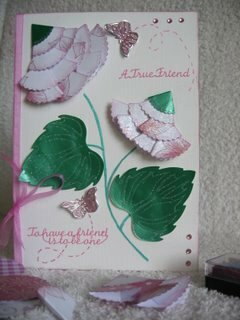 This pretty card is created with a scalloped circle punch. With the addition of some Glamour Dust and gemstones it is suitable for any occasion. The stems to the flower have been hand drawn, but could just as easily be a thin strip of green paper. The leaves could be punched, diecut or stamped, or whatever it is that you have to create them. Cut out lots of circle shapes, in different patterns. 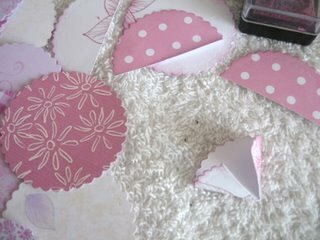 I have used a scalloped punch to create my circles, for a pretty edge. Cut them in half and ink all the edges with a Blending Tool. With the wrong side facing you, fold each of the straight edges in to the center, to create the petals. Each petal will be slotted and glued into the previous one. Lay the first one with the right side facing you and slot two petals into it. Glue in place. Then into each of these petals slot two more. Continue until the flower is as big as you wish it to be, glueing as you go. Assemble the flower onto the card front. Draw in the stem and add the leaves where you like them best. These leaves are die cut from Spellbinders. The sentiment is a peel off, and the butterflies are Peel Offs added to some Acetate. The butterflies trails are hand drawn with Sakura Pens. 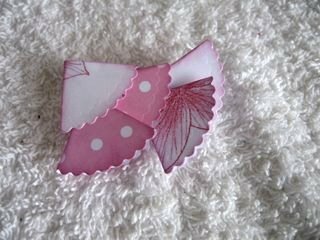 An easy but effective card to make, and a project you may like to do with children. Ribbon and gemstones are the finishing touch.